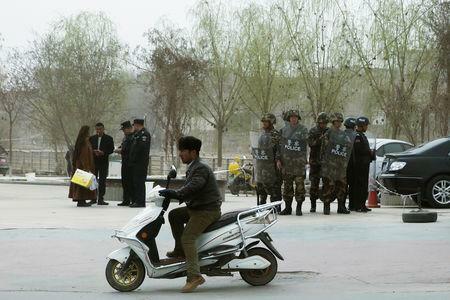 BEIJING (Reuters) - The Turkic mostly Muslim Uighur minority in China's Xinjiang region face arbitrary detentions, daily restrictions on religious practice and "forced political indoctrination" in a mass security crackdown, Human Rights Watch said on Monday. Beijing has denied that such camps are for "political education" and says they are instead vocational training centers, part of government initiatives to bolster economic growth and social mobility in the region. Measures in Xinjiang aim to "promote stability, development, unity and livelihoods", while also cracking down on "ethnic separatism and violent terrorist criminal activities", he told a regular briefing.